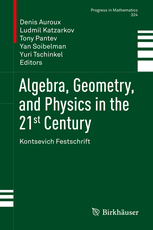 This volume is a tribute to Maxim Kontsevich, one of the most original and influential mathematicians of our time. Maxim’s vision has inspired major developments in many areas of mathematics, ranging all the way from probability theory to motives over finite fields, and has brought forth a paradigm shift at the interface of modern geometry and mathematical physics. Many of his papers have opened completely new directions of research and led to the solutions of many classical problems. This book collects papers by leading experts currently engaged in research on topics close to Maxim’s heart.